I’ve been wanting to write a post about the new year, well….. ever since the new year. And I can’t believe that we’re nearing the end of February! If you’re anything like me, you’ll be wondering where the time goes. Sorry it’s taken me so long! I wanted to start 2015 with some very clear goals, plans and ideas because I am determined to be a little more organised this year. To help get me started, I have spent a lot of time reassessing where my business is heading in 2015. My sister (from That Healthy Girl) visited recently, and we spent a really productive day helping each other come up with some important directions for 2015. Even though our businesses are completely different, it’s funny how the fundamentals are still the same! In January I also joined with some local ladies to create a bit of a ‘mastermind group’ where we plan, encourage, support and promote each other’s enterprises. I’ve found this monthly meeting to be invaluable (and it’s only February)! One of my best ‘organisational moves’ was teaming up with an accountability partner. She’s a busy, busy lady, with a business on a much larger scale than my own. But it’s lovely be able to encourage her with her goals, and have her to keep me accountable in reaching my own. I’ve become obsessed with inspirational podcasts, including listening to Abby Glassenberg on While She Naps (who’s spoken to a veritable ‘who’s who’ in the craft world), and to Kari Chapin on AIM (who’s just starting out, but is immensely entertaining). My ‘audible’ library is also growing and I’ve been enjoying The Fortune Cookie Principal by Bernadette Jiwa (thanks for the tip Jen). And Manage Your Day-To-Day has literally changed my life! *there’s no affiliate links here, or kick-backs for me. I just wanted to share my finds! In an attempt to tackle the pile of UFO’s (unfinished objects) in my craft space and sketch book, I’ve decided to institute a kind of ‘Finish It Friday’ plan. Last Friday, I got busy with appliqué and created a gorgeous new range of tees for sale. If you’re in Australia, you can pick them up HERE. If not, you can browse the instant download pattern range HERE. 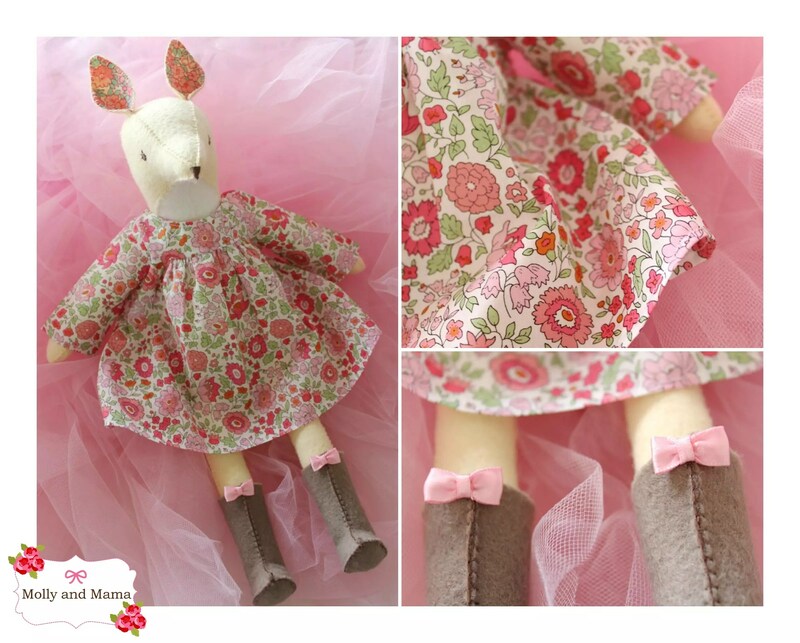 Today, I finally finished a beautiful hand stitched felt doe made from a pattern by Posie Gets Cozy. I started it for my daughter in early December and had intended for it to be a Christmas Present. I’m so glad I finished it off. And it turned out so much better than I thought. It was wonderful combining my three loves; hand stitching, wool felt and Liberty fabric. Completing this today has encouraged me to begin a kind of ‘Finish It Friday’ routine, in an attempt to tackle the long list of half-started and half-baked creations I’ve begun in the past. I’ll look forward to sharing more completed projects with you on the Fridays to come. Do you have a creative business? What are your goals for 2015? What sorts of plans do you have to help you achieve your dreams this year? I’d love to hear! I can’t wait to share more of what’s happening in Molly and Mama land, and I hope that it inspires you to follow your dreams and encourage your own creative aspirations. So stay tuned!